After five years of standing in line watching men and women, propped up babies on hips and grandparents escorted with walkers, this year was different altogether. It is both encouraging and discouraging to see the crowd grow year after year at the Commemorative Walk for survivors of homicide-loss. It’s been my privilege to listen to and learn from these men and women in a weekly support group, but to see them walk through candlelit paths holding photos of their murdered husbands, sons, grandsons, wives, mothers and grandmothers is altogether horrifying and holy at the same time. And it has been every year these last five years since the very first walk. It is always holy in the way honestly telling the honest truth is always holy and almost always horrifying. But this year, there was something new for me as I stood in the evening’s mist. Looking into the line of men and women with faces barely glowing from the candles in their hands, I saw my students. The clock strikes nine every Monday, Wednesday and Friday and my students are faithful to be patient with me in class as I dance onto tangents, threaten with grades and bribe with food. They have listened to me grow awkwardly teary about the histories of movers and shakers from the margins of the field whom God has used to bring kingdom change across the globe. They have held on as we’ve acted out counseling sessions, as we’ve debated the reasons for poverty and welfare, and as we have pushed the questions of power dynamics and our goodwill to the limits. They always show up. 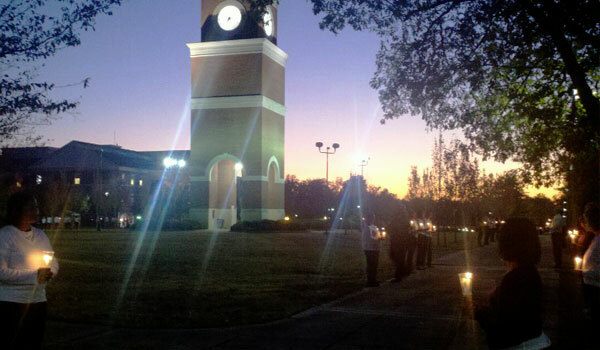 But this night, lining the sidewalks where women and men who have become dear to me walk through their glowing candles and make clear that their murdered loved ones will not be forgotten, my students showed up. As tears filled my own eyes, I lost my breath in thinking that these very students were standing physically and symbolically right on a dangerous line. They were being both witness to the hard and horrible and hopeless truths like rampant homicide in a community, and were also making a symbolic promise that as social workers who are Christians they will join in the kingdom work to make peace on earth as it is in heaven. My prayer for those students and any of my students, is that some day in the not-so-distant future there will be professors of Social Work or Theology or Education or Business standing up in front of their own classes telling the names of my students, and talking about how they pushed in from the margins to make peace and to change the world with and for Christ and his kingdom. And when I hear those stories told, I’ll remember the way their faces glowed this night. There is something quite stunning about this group of men and women. I watched them walk through the candle-lit, witness-lined path at the fourth annual Remember Me walk for homicide-loss survivors, and while emotions varied from person to person, there was a stunning mark of resilience that was breathtaking on all faces. Faces covered in tears beamed with resilience. Faces covered in solemnness beamed with resilience. I am prone to be all one thing. But I am learning the deeply human art of being all of two things at once. I am learning to carry two emotions in their fulness at one time, refusing to let one swallow up the other. I can be enraged at injustice, arrogance and ignorance on my own part or the part of others that causes grief and pain in the world; and at the same time, I can be grateful for the peacemaking, the meekness and the thoughtful engagement on my own part or the part of others that slowly gives promise to the reality of the coming kingdom. There is this need for the truly human women and men to stand in a space between horror and hope and refuse to lie about the former in an effort to find the latter. There is a call to stand, much like Christ, with arms outstretched in an effort to keep a tight grip on both reality and promise, knowing our hearts can hold the tension. And these men and women––walking with photographs in hand of the husband, daughter, mother, grandbaby they had ripped from their lives in violent murder––they walk, faces shining with complete resilience and complete grief. They promise by the mere act of putting one foot in front of the other that God has placed deeply within us his own nature of being fully enraged and fully proud of all that humanity is and will one day be.